Travel photos help tell stories to your friends that weren’t there. Travel photos help you relive the memories of a trip for years to come. Travel photos can also be great home decorations. All these assume however, that you’ve shot an in-focus, properly exposed and interesting photo. Yesterday we discussed how the aperture setting plays an important part in how your photo will ultimately look. Today we discuss shutter speed, the second of three settings you can make to help capture some quality vacation photos. Let’s say you’ve got some friends vacationing in Cleveland this summer and you decide to take them on Lollie the Trolley. Shutter speed is probably the number one issue to consider if you will be taking photos from a moving vehicle. “Shutter speed” refers to the amount of time the lens stays open to allow light to reach either your camera’s film or CCD. In the ideal world, when you take a photo you want the subject to be stationery and the photographer should have his/her feet planted firmly on the ground. Shooting pictures from a bus pits you against all odds. The way to win this war is through shutter speed settings. Your camera may have a mode marked “S” for shutter speed priority or it may be marked “T” for time priority. They both accomplish the same purpose. In essence, what we are going to do is try to set the shutter speed as high as possible to overcome the movement of the vehicle. By taking charge of your camera, instead of leaving it in program mode or auto mode, we can assign a shutter speed that will help overcome the moving vehicle issue. Try and see if your camera will allow you to set a shutter speed of 1/500 of a second (or more.) At that speed, if your subject is a reasonable distance away from your camera, it will probably appear sharp. 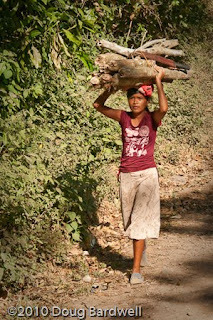 In the accompanying photo today, I was standing in the back of a fast moving pickup truck, but was able to capture this woman carrying firewood in El Salvador because I had preset my camera to a shutter speed of 1/500 of a second and set my ISO speed to 400. The distance issue is an important concept that works hand-in-hand with shutter speed. Objects that are very close (5 -10 feet) will be almost impossible to shoot without blur. Objects from 20-50 feet away should work fine and those over 50 feet away should look very sharp, assuming you hold your camera as steadily as possible. Direction is the final part of the equation. Objects moving perpendicular to your direction are the most difficult to capture crisply. People or other vehicles moving towards you or away from you are much easier. Next time you find yourself as a passenger in a car or on a bus, try capturing some photos using your camera’s auto settings. Then try setting the shutter speed up to 1/500 or faster and shoot some more similar shots. I know you’ll be pleasantly surprised at the improvement. Tomorrow we’ll discuss ISO speeds and the part they play in your overall image.